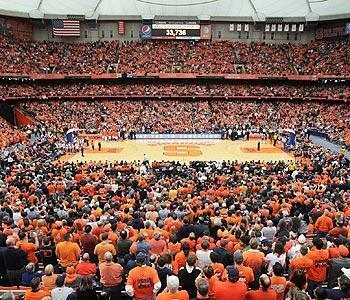 SYRACUSE, N.Y. – During a decade in which Syracuse basketball reached the pinnacle of national prominence, the program was awash in positive drug tests and, in many cases, failed to adhere to its internal drug policy while playing ineligible players, Yahoo! Sports has learned. Over the course of a three-month investigation, four sources with intimate knowledge of the Syracuse men's basketball program told Yahoo! Sports at least 10 players since 2001 have tested positive for a banned recreational substance or substances. The sources said all 10 of those players were allowed to practice and play at times when they should have been suspended by the athletic department, including instances when some players may not have known of their own ineligibility. The four sources said Syracuse violated its drug policy in at least two areas: failing to properly count positive tests; and playing ineligible players after they should have been subject to suspension. A fifth source, a former Syracuse basketball player, told Yahoo! Sports he was questioned by the NCAA regarding the school's drug testing policy. Syracuse officials released a statement Monday evening about two hours after Y! Sports' report was published, saying the university has self-reported potential violations to the NCAA and the inquiry doesn't involve current players. However, four sources said the breadth of potential violations could apply to Syracuse seasons as far back as 2001 and include the 2002-03 national championship season. "We self-reported issues with drug testing to the NCAA, and there is currently an ongoing inquiry," Syracuse said in the statement. "The inquiry does not involve any current SU student-athletes. To ensure the integrity of the ongoing process, we are unable to comment further at this time." The NCAA also released a statement Monday night confirming Syracuse "appropriately" self-reported the violations "several months ago." The NCAA said its investigation is ongoing. 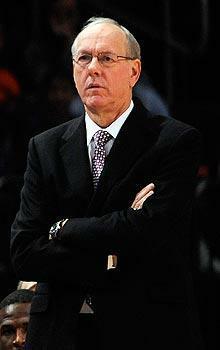 Hall of Fame coach Jim Boeheim, who has guided the current Syracuse team to a 30-1 record and No. 2 national record, had earlier declined to comment when contacted by Y! Sports. Asked if he had any knowledge of an NCAA investigation, Boeheim again declined comment. “Obviously, I’m not going to talk about anything at all,” he said. If Syracuse knowingly violated its own drug policies, it could trigger the NCAA's "Willful Violators" clause, which allows the association to bypass its four-year statute of limitations in favor of levying sanctions as far back as the first in a series of continued infractions. A willful violation is considered one that occurs during a pattern of deliberate or intentional rule-breaking. Beyond statute-of-limitations issues, Syracuse could also be charged with lack of institutional control for failing to adhere to its own drug policy, similar to sanctions recently levied against Baylor University. A wide-ranging NCAA inquiry into the Bears' basketball program in 2005 revealed the athletic department failed to follow its established guidelines by concealing positive marijuana tests for three players. A report released by the NCAA's Committee on Infractions after the Baylor investigation stated: "The failure of the university to follow its own [drug testing] procedures demonstrated a lack of institutional control." Yahoo! Sports reviewed Syracuse's student-athlete drug policies dating to the 2000-01 school year. They detailed the athletic department's protocol for handling positive tests, including a penalty structure for a player's first, second and third offense. Each penalty called for the head coach to be notified and, in turn, alert a player's parents or guardians. After the first offense, an athlete was required to attend drug counseling and rehabilitation sessions. In addition, the policy called for the offending athlete to be tested on a regular basis for the remainder of his or her eligibility. Penalties for a second positive test included automatic suspension from practice and playing, plus mandatory drug counseling, and a player could not return to the team without being cleared by a counselor as being drug free. For a third positive test, a player was subject to termination of eligibility and expulsion from school, barring special intervention by the athletic director. The policy stated that after a third failed test, the athletic director had the option of extending a "one-time conditional grace period" in which the athlete was subject to specific terms and conditions for corrective action during a predetermined period of time. Two sources told Yahoo! Sports that of the 10 players, at least one player continued to play after failing four tests and another player played after failing three. NCAA member schools are not required to have their own drug-testing policy, though most choose to do so because of potential legal and disciplinary ramifications. The NCAA itself tests at championship events, and will be conducting random testing in the NCAA basketball tournament that begins next week, but otherwise schools are left to police themselves for drugs on their own terms. However, the NCAA alerts member schools that when setting internal testing procedures, the ability of the school to follow its own guidelines is subject to NCAA oversight and sanctioning. This is the regulation which puts Syracuse at risk for potentially failing to follow its own policies. There is no uniform national drug policy, nor do most conferences have a set testing protocol or penalty structure for their member schools. In fact, Big East associate commissioner for compliance Joseph D'Antonio told Yahoo! Sports last week that he doesn't even know what the drug policies are from school to school within the league. Syracuse is a member of the Big East. Should Syracuse come under NCAA scrutiny for drug-testing failures, it would be the latest in a sometimes tumultuous decade for Boeheim's program. Multiple players have had legal or disciplinary issues over that span, including Billy Edelin, Eric Devendorf, Jonny Flynn, Rick Jackson, Josh Wright, Dayshawn Wright, Scoop Jardine and Fab Melo. A previous Yahoo! Sports report also found that a sports agency secured a $50,000 loan for the uncle of then-guard Donté Greene, in hopes of signing Greene once he departed for the NBA. Most recently, Syracuse assistant coach Bernie Fine was accused of sexual molestation by a former Orange ball boy and his brother. While charges were not filed against Fine, he was ultimately fired from his coaching position. Contact Yahoo! Sports investigative reporter Charles Robinson at WindyCityScribe@yahoo.com. Contact Yahoo! Sports national college columnist Pat Forde at PForde@yahoo-inc.com.